The performer will borrows any smartphone from a spectator and searches tattoo designs on the internet. The spectator will choose one of the designs from the list. Next, the performer will show his metal tag chain, which is empty on both sides, and puts it in the spectator's hand. Unexplainably, when the spectator opens their hand, their chosen logo is imprinted on the tag. This is a beautifully packaged item. 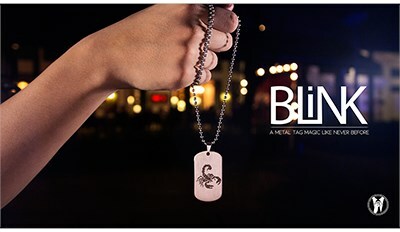 Silver dog tags and a chain come in a specially designed black box with inserts molded to the props and a credit card sized flash drive loaded with video instructions. But this trick is also loaded with cumbersome elements that run counter to the product’s elegance. After displaying a blank dog tag on a chain around your neck, you borrow a spectator’s smart phone and navigate to a Facebook page by entering an elaborate address. Arriving at a screen of symbols, one is “freely chosen” by the spectator. A magical wave, and that symbol drains of color on the screen, and the symbol is now etched on the dog tag. The removal of the chain from the performer’s neck, a key moment, is laborious, and the clean-up of the effect even more so, as one must delete browsing history from the spectator’s smart phone. Added to this is an ugly moment that occurs when the purchaser, after spending $70, is told that a preferred forcing technique can be found in the instructions for another product sold by the company. Considerations: It’s pretty easy to come up other methods for this effect in which the “freely selected” design is a freely selected design.